As we age, the skin's natural processes of cell renewal begin to slow and skin loses elasticity. 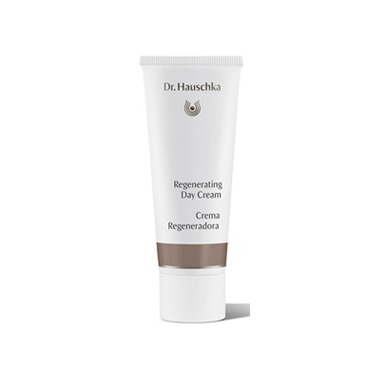 Dr. Hauschka Regenerating Day Cream supports the skin's natural regenerative functions, enhancing skin elasticity, balancing moisture content and making skin feel smooth, soft, firm and supple. The appearance of fine lines and wrinkles is minimized and skin looks noticeably more vital and radiant. Dr. Hauschka Skin Care has been 100% natural for over 45 years and is certified natural by NATRUE, a non-profit, international association founded by the pioneers of natural and organic cosmetics. NATRUE certification ensures that a product has met the strongest criteria available for natural and organic ingredients in cosmetics and is free of synthetic preservatives, fragrances, dyes and petroleum derived synthetics. I've been using the Regenerating line for a short time. I love that it is natural, light and hydrates my 70+ skin. It's a big improvement over the more expensive, heavier products I had been using. Very little is needed to hydrate your skin, great for winter. I have been using Dr Hauschka products for years now. I use the regenerating day cream and the foundation every day. The day cream is very soothing. This is my favourite moisturizer; not greasy but totally moisturizing and I love the scent. Can't live without Dr Hauschka products! Does not irritate my skin and is good quality. The smell is not so great but not terrible.